Sai Dham Enclave, located in Allahabad, is a residential development of Sai Dham. It offers spacious and skillfully designed 3BHK independent floors. The project is well equipped with all the basic amenities to facilitate the needs of the residents. The site is in close proximity to various civic utilities. Where is Sai Dham Enclave located? 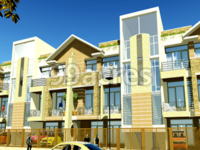 Ashok Nagar, a prime residential locality for house seekers in Allahabad. When is the possession of Sai Dham Enclave expected?The project is slated for delivery in May 2019. Does Sai Dham Enclave have lawn tennis? The project doesn't have lawn tennis. Is there a club house in Sai Dham Enclave? The project doesn't have a Club House. How can I check the RERA approval of Sai Dham Enclave? This project is RERA approved. It can be checked on the RERA official website of the State.